Hello from Skaro, planet of the Daleks, welcoming you to the home of the Dalek Supreme. 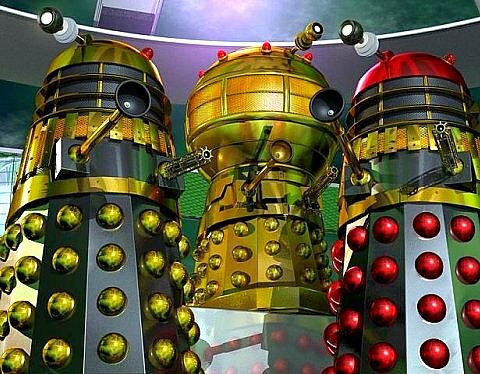 This site is for all of you dedicated Dalek fans out there, and although the site covers a bit about Dr Who, it is produced 100% entirely for all things connected with his number 1 arch enemies, THE DALEKS. Please enjoy your visit to the planet of Skaro, home of the Dalek Supreme and the birthplace of everything Dalek. In December 2013 the Daleks had been on our TV screens for 50 years. Here is a nice picture to celebrate this event. Doctor Who and the Daleks are owned by the BBC and no infringement of copyrights were intended making this site, as it was done to honour this long lasting cult TV show by myself, who has been a fan since 1963 when I watched the very first episode which starred William Hartnell and saw my very first Daleks in December 1963. 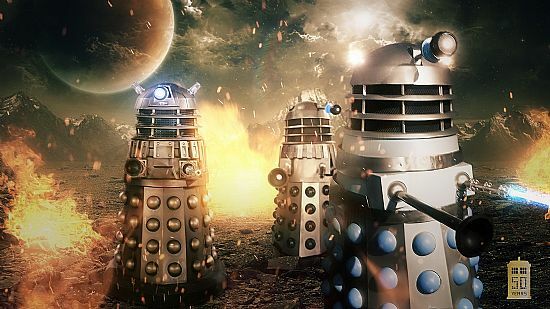 We Daleks do welcome human visitors to our home planet of Skaro, and we promise you will not be EX-TER-MIN-ATED, at least not until "Doomsday" that is! I would like to thank Steve Redfearn for creating this great picture of the Dalek Supreme, as he did this exclusively for my site. Cheers Steve! Please Note} The above picture is exclusive to this web site, and must not be copied without permission. 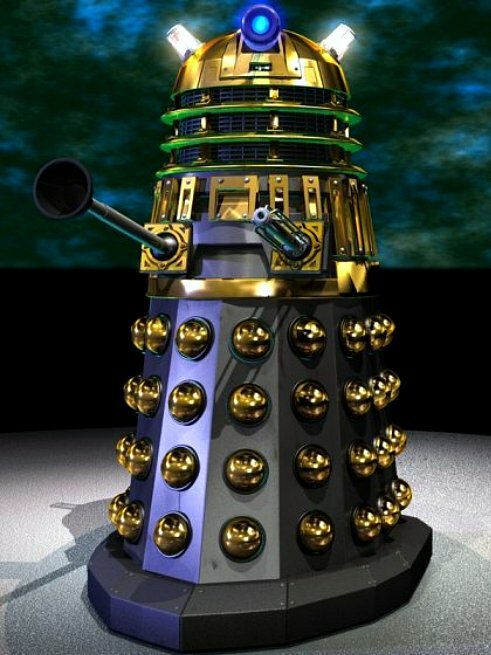 Welcome to my site which is lovingly dedicated to the arch enemies of the Time Lord known as Doctor Who - "The Daleks." 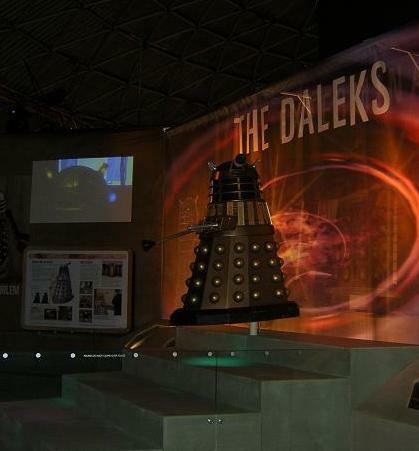 The Emperor Dalek welcomes all Dalek fans to Skaro, home planet of the Dalek race. This dedicated Dalek site will build to contain as much information as I can find about Daleks, and their creators in both fiction and real life; namely Davros the Kaled Scientist, and Terry Nation, the man who gave us the Daleks back on BBC television back in December 1963. But first and foremost, this is a site created for all you Dalek fans out there. 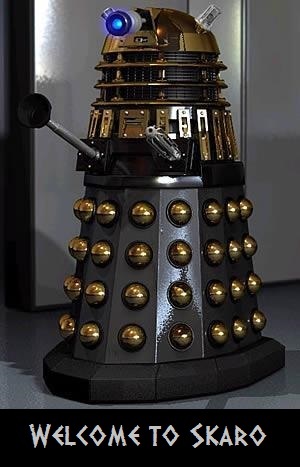 Let's face it, they are the greatest TV alien ever created in my humble opinion for making children hide behind the sofa in fear, as they uttered those immortal words that made many a youngster dash off as they heard, "EXTERMINATE" issue from the Dalek machines prior to killing their foes. 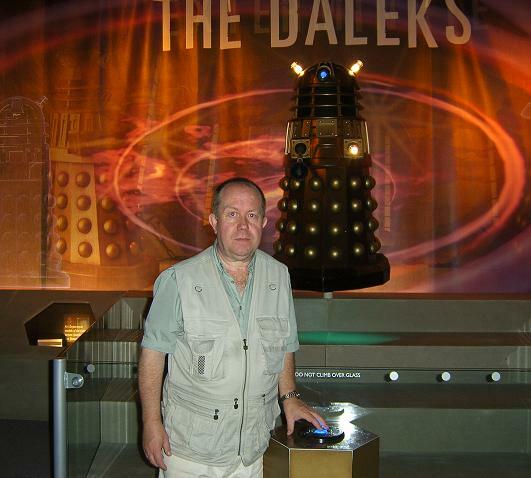 So here I am with a Dalek friend in the background. A true fan of everything Dalek since my first encounter with them back in 1963. This photo was taken in the summer of 2005, when my wife and I visited the Doctor Who Exhibition on the Palace Pier, Brighton on the Sussex coast in Southern England. My knowledge on Daleks and Dr. Who is reasonably extensive, and I will endeavour to help anyone who may ask me a question about this great British TV series which now has a worldwide following of Cult Sci-Fi fans; and has become a major institution of our lives. If anyone has any good Dalek or Doctor Who photos they would like included on this site, please post them on my Dalek Forum. Thanks to all my visitors and I hope you enjoy this site.